- Hot bed high-power extension module, compact atmosphere. - 3D Printer High Power Heatbed Module MOS Tube High Current Load Power Expansion. - Unique snowflake heat sink design, heat dissipation is more strong, solve the bed with heat power is too large, the current load problem. - This module is based on power MOSFET and will allow PID control of the heated bed (DC-DC Relays usually do not allow this). Note: This module under the normal heat dissipation, the measured when I (Max) = 30A can stable long-term work, in use process, current do not more than 30A. - Supply/Operating Voltage: 12V-50V (12-24VDC recommended). Please connect another high power module when Heated Bed power is more than 150W. 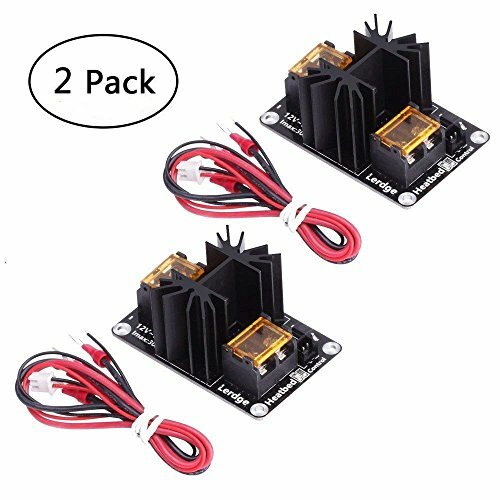 2Set Heated Bed Mosfet Module with Cables for 3D printer. Widely use in Anet A8, A6, A2; rampps; MK8; RepRap 3D printer. With the heat sink power module to your controller board, it can increase the maximum current up to 30A. Under the condition of normal cooling, it works stably under I (Max) = 30A, the current must NOT exceed 30A during the working process. When using heated bed 3D printer for 12V power supply which may cause excessive current during times, with this module, it can well protect the connectors on the controller board from burning.